Summary: Unlike a common birthday card maker, there is a complete new one for you to make html5 animated happy birthday cards with heart-warming birthday wishes for your dear ones. With this comprehensive guide, you will know more clearly how to make a birthday card online with this new card creator. 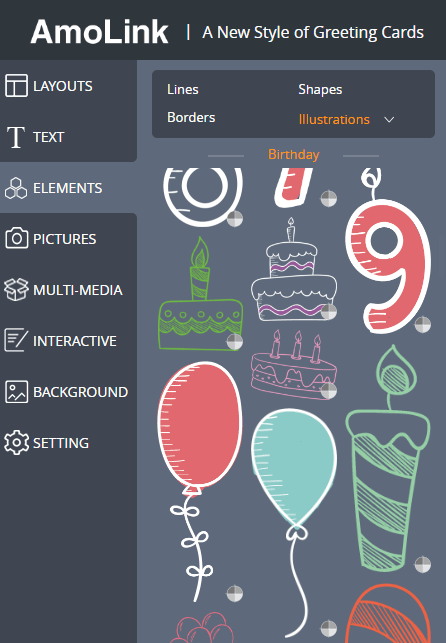 Entering the create page, the first function you see is various card layouts, you can choose from our library of professional birthday card layouts or use our drag-and-drop design tool to create your own! 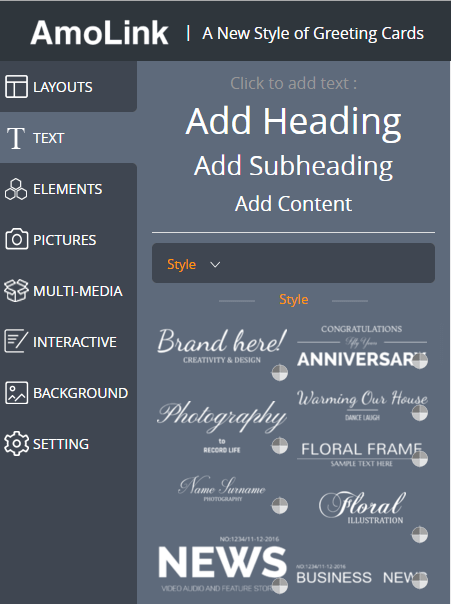 In addition, if you select the layout we offer, you can edit the content of it. 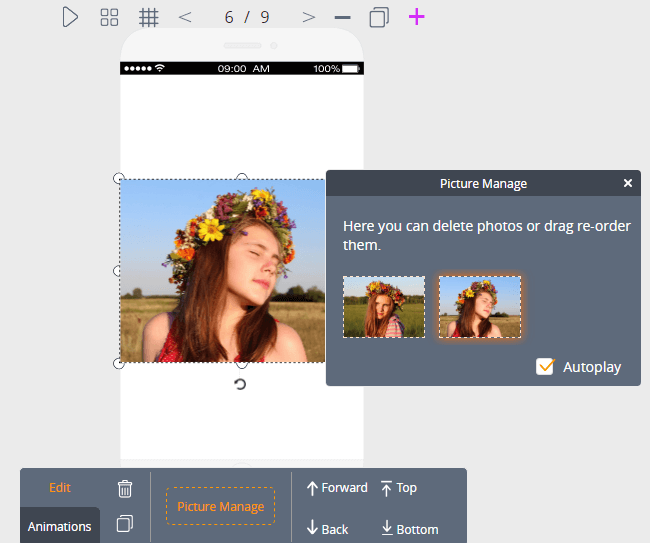 You could replace the sample texts with your, change the layout’s background, photo, color and etc. For example, changing the text of the ‘happy birthday’ and replace the photos of it, which can present a different style. 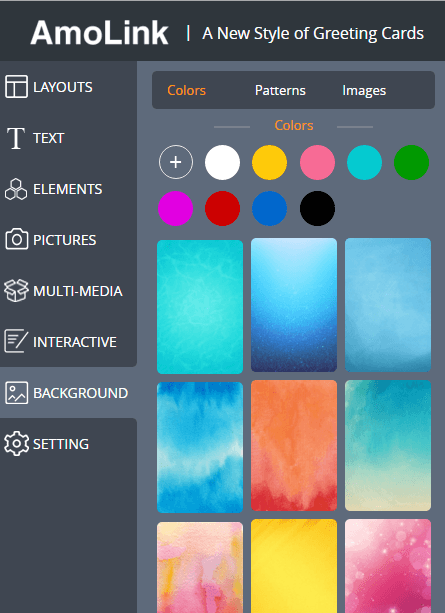 What’s more, you could add animations just use the edit board in the bottom of create page. Setting some dynamic effects for your text will make your birthday card design more vivid and rich. Various text styles for using on different occasions. That is to say, even for the same type of cards for celebrating Birthday, there are various styles available for children, parents or birthday cards for friends. Especially when we write our birthday wishes, for the different degree of formality, the text of funny birthday wishes must be different from the text of official birthday wishes. Otherwise, changing text colors and size also can change the style of birthday card, you can try it until find your fond style, which is really freedom for you to make a birthday card online in AmoLink. Elements of photos, colors and shapes are a must-have for a birthday card design, especially when you're willing to customize one on your own without presets of layouts or birthday card template. 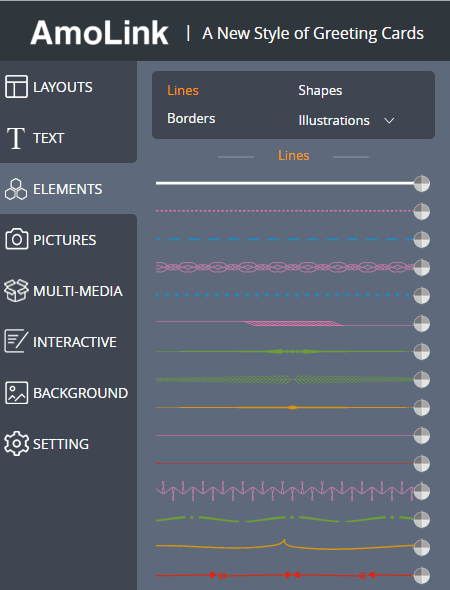 In AmoLink, when you click elements, you will see four parts, including lines, shapes, borders and illustrations. Unlike a common birthday card maker, there is a complete new one for you to make html5 animated happy birthday cards with heart-warming birthday wishes for your dear ones. 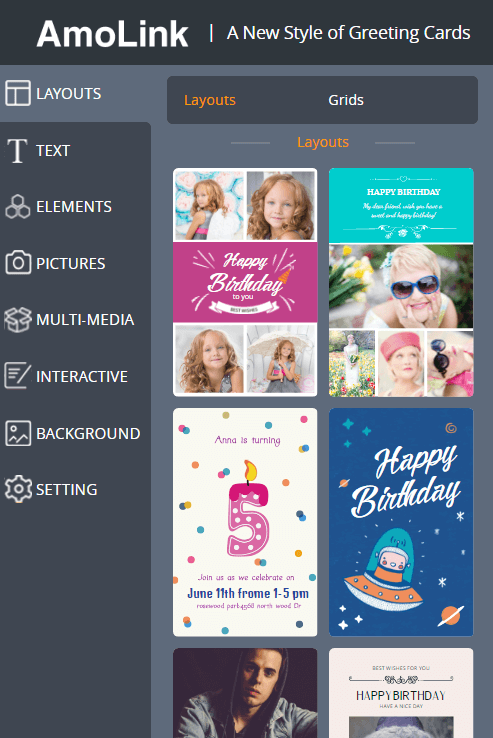 With this comprehensive guide, you will know more clearly how to make a birthday card online with this new card creator. Just need to choose proper illustrations from this rich category to touch up your birthday card design. Such as the birthday category, you can pick up some elements from that to decorate your birthday card. 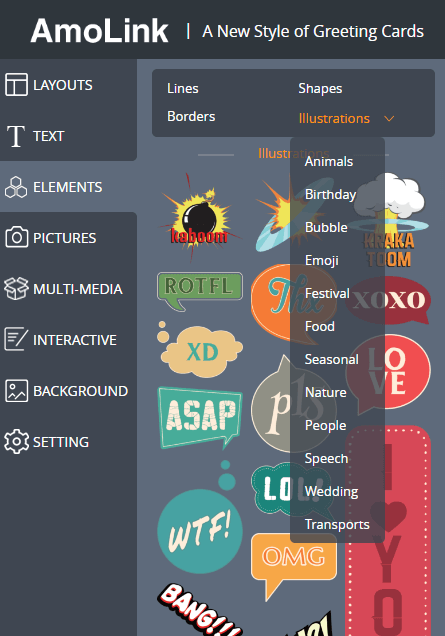 As well to pick some emojis, bubbles to touch up the birthday card design or polish the birthday wishes, We will further rich our elements category in our next new version to give better service to you, please continue to focus us. Make a birthday online must have obvious advantages compared with buying traditional birthday cards in store. 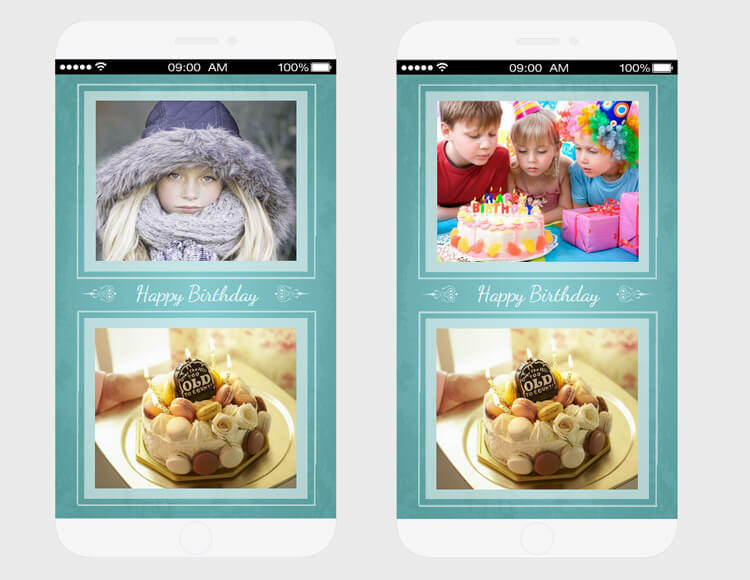 AmoLink birthday card maker provides a great number of photo categories for you, many of them may even stimulate your creativity in designing happy birthday cards. Just need to click the drop-down-list of photos, as shown below. You can find a lot of categories, animals, beauty, buildings, people and etc. just pick your fond photo and then drag it to the create era. As well, you can upload your own images from PC. If you make birthday cards for friends, you can upload your funny or warming group photos and then add some elements, text and animations in these photos to make photo happy birthday card for your friends. 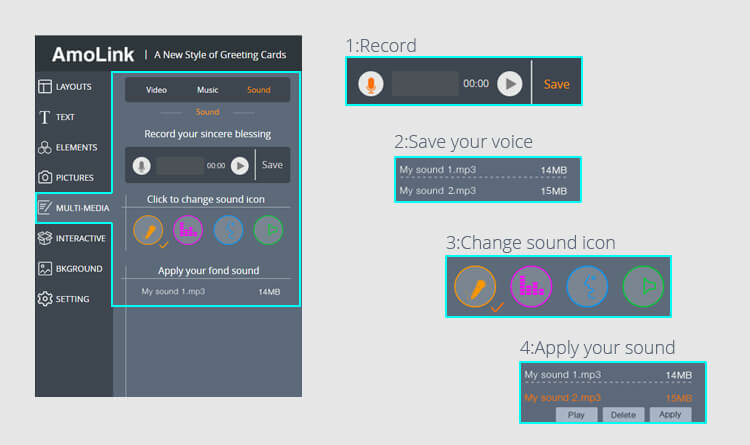 Once the photos are loaded onto your card, you may go further to facilitate the animation effects provided by this tool. By applying some dynamic effects like fade in down, bounce out, flash and etc. to your photos, which will make your birthday cards more vivid and impressive. After adding some animation effects to your birthday card design, we can see the birthday card is more lively and attractive. In pictures column, there has a very practical function – galleries, you can add more photos at the same time. 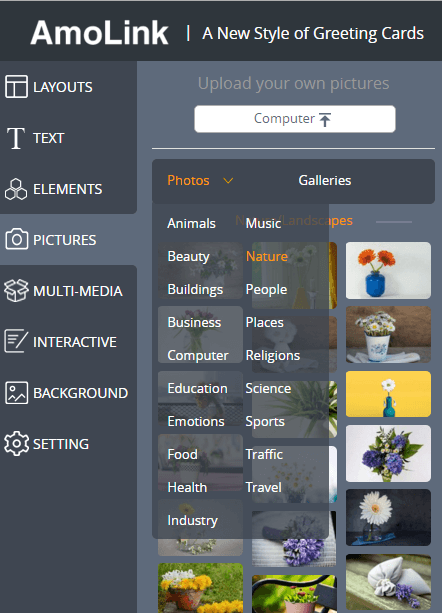 When you choose galleries, you can drag or upload your pictures to it, then edit and manage your pictures in the edit board, like adding more pictures and editing the pictures, as follows. Do you fancy the idea of adding the recipient’s favorite song to the birthday eCards? 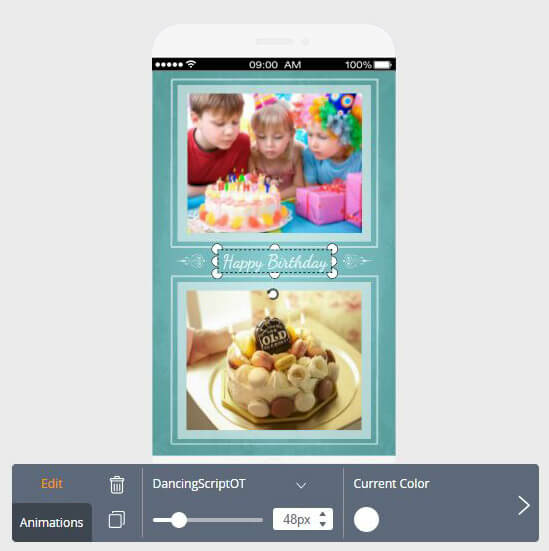 Within the music, photo, video, sound and dynamic effects provided by AmoLink birthday card maker, you can easily turn your card to dynamic art work with multimedia elements. Fully showing what you see is what you get, that is the main difference between AmoLink and other online card makers. When you make a birthday card online and want to record your birthday wishes to your loved ones. You just need to follow the next 4 steps as shown. After complete your birthday card design, remember to save it. However, if you have logged in, the system will automatically save your design, then you will find your all of your work in My Projects page, there you can preview, share or further edit your birthday card. You can deliver your finished birthday card to web via social accounts, email or messages just with a link. 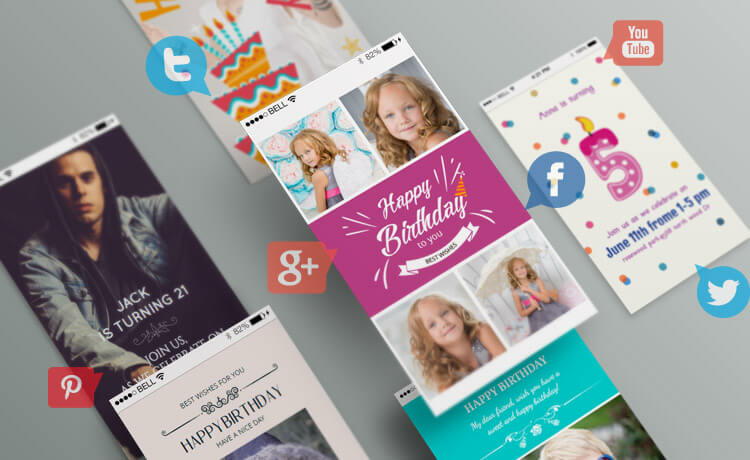 This birthday card is mobile-friendly and can be viewed conveniently on iPhone, iPad, Android and other devices. Therefore, no matter they’re in front of computer or on the way, they can all view your birthday wishes on their devices in hand. No design experience? No problem! 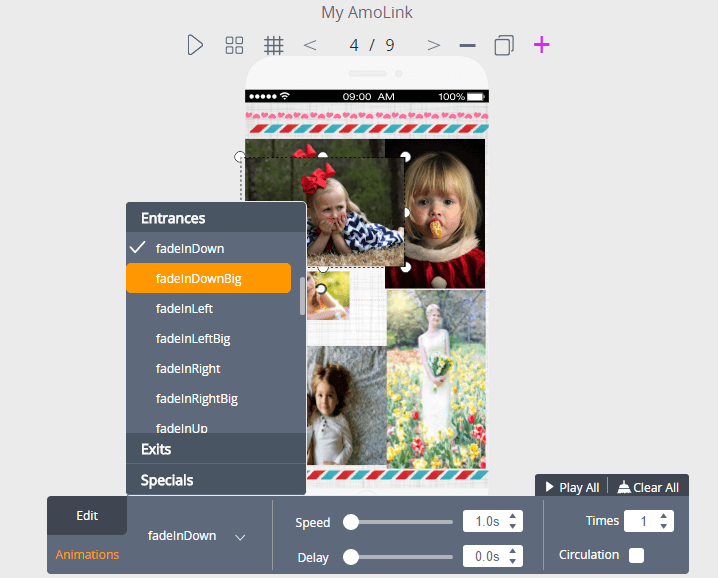 Let's start from scratch and get familiar with the basic AmoLink tool that will help you make a birthday card online for free.